Ever since I was a little kid, I’ve had a fascination with bridges. So when I heard on the news last night that a bridge crossing Lake Michigan was proposed, I was intrigued. 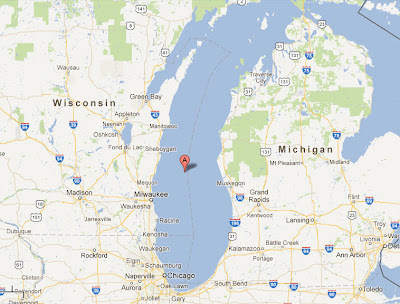 I live on the shore of Lake Michigan and I can tell you this – it’s BIG. So, I was intrigued by the prospect of a bridge crossing over it. Connecting the shores of Wisconsin with Michigan with a bridge would be mind-boggling. It would keep me entertained for years. Then I got to thinking about it and realized such an endeavor would be . . .
First, let’s talk about the size of the bridge. The longest bridge I know of crosses Lake Ponchartrain in Louisiana and it’s 24 miles long. Lake Michigan is 90 miles across, so this thing would be over three times longer. But the real clincher is that Lake Ponchartrain is little more than a swamp; it’s probably about seven inches deep, so its 24-mile bridge is no big feat. Lake Michigan is 300 feet deep. You do the comparison. Let’s talk about the weather up here. Namely, winter. For three months of the year, Lake Michigan is inundated with wind-driven, thick ice and blizzards. Ships don’t even brave Lake Michigan in the winter. Would you want to drive an automobile 90 miles across that? What if you needed to stop for a bathroom break? What if you needed gas? Or worse – How would you stop for Starbucks? Now, let’s talk about practicality. Why would we need a bridge across Lake Michigan? One argument is so that people in Wisconsin and Michigan could cross over without having to go through Chicago. So, yes, a big bridge across the lake would be cool. I’d find it fascinating. Intriguing idea to think about. I grew up in Wisconsin and then moved to Michigan. I always wanted to take the ferry but never did so. Can't think of why I would have taken a bride. The population of WI isn't as concentrated as Illinois but a majority of people in the Milwaukee, Racine, Kenosha are would be better off going through Chicago. Similarly, people from the nothern part of the state can take a bridge now at Mackinaw. How many students from Madison can be in that big of a hurry to get to Saugatuk?